Based on Ken French’s factor data during 1951-2013, portfolios that each month select the top 30% of stocks based on B/P and E/P deliver average annual gross value premiums of 3.2% and 4.4%, respectively. Over the entire sample period, E/P beats B/P based on average annual gross return (16.0% versus 14.8%) and standard deviation of annual returns (15.7% versus 16.1%). However, B/P outperforms E/P during 1963-1990 and thereby became an academic standard. Based on S&P 500 stock data during 1973-2013, portfolios that each quarter select the top 30% of stocks based on B/P and E/P (with round-trip trading friction 0.12%) deliver net compound annual growth rates (CAGR) of 12.8% and 13.5%, respectively, compared to 10.3% for the index. Corresponding net annual Sharpe ratios are 0.44, 0.52 and 0.35, respectively. A strategy based on a blended 50% B/P-50% E/P signal outperform both single-metric strategies overall (CAGR 14.2% and Sharpe ratio 0.53) and during most rolling 10-year intervals. Lowers net annual Sharpe ratios to 0.41, 0.48 and 0.49 for B/P, E/P and the blended metric, respectively. Reduces benchmark tracking error by more than half. Reduces portfolio turnover by about a factor of three. Constraining an S&P 500 stock portfolio that tilts moderately toward the blended value metric to stay within +/- 1% of the sector exposures of the benchmark index boosts net annual Sharpe ratio to 0.54 (see the chart below). Optimized – Blend: an S&P 500 stock portfolio tilted moderately toward value stocks to achieve an index tracking error of 2-4%. 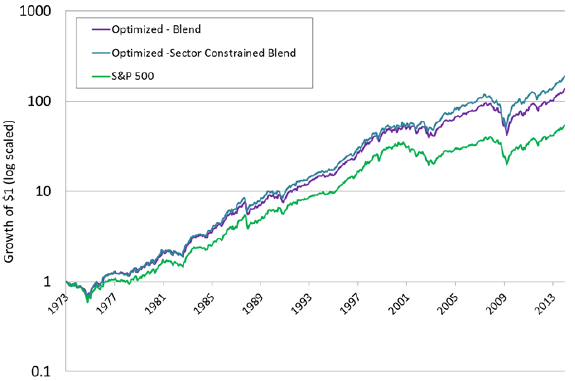 Optimized Sector Constrained Blend: adding to Optimized – Blend a constraint to stay within +/- 1% of the sector exposures of the benchmark index. S&P 500: the capitalization-weighted benchmark. Results show that, with low round-trip trading frictions of 0.12%, the value strategies outperform the benchmark index consistently. In summary, evidence indicates that value strategies applied to U.S. stocks outperform the market when portfolio trading frictions are low, with a blended value metric generally outperforming individual metrics and value tilts competitive with pure value. Assumed round-trip trading frictions of 0.12% for S&P 500 stocks are very low for large parts of sample periods and for individuals generally. As noted in the paper, outcomes ignore any fees that a fund manager would charge to maintain specified portfolios. Testing many strategies on the same data introduces snooping bias, such that the best-performing strategy likely overstates expectations. There may be incremental snooping bias (both inherent and inherited from prior research) in selecting strategy features such as specific value metrics and optimization/constraint parameter settings.